10:30 AM A Celebration of Christmas Music. During the 10:30 celebration of the Holy Eucharist, we will once again have our annual “Sermon in Song”. There will be a single, quiet celebration of the Holy Eucharist. It will take place in the Children’s Chapel and will begin at 10:30 AM. There will be two celebrations. >> The first Holy Eucharist of Christmas. There will also be another, quieter service (with music) beginning at 11:30 PM. Enjoy our annual Christmas Pageant! The majority of the youth will be performing. This would be a wonderful opportunity to invite family and friends. If you would like more information on the Pageant please contact Judy Rudd. For more information please contact Pat Tallman. Christmas Project Sorting will be also be after the 10:30 service. For more information please contact Carol Nancarrow. donation envelopes are available in the pews. Pledge envelopes will be available to pick up next Sunday on the ushers table. The office will be closed on Friday, December 15th and Monday, December 25th. The Vestry Meeting scheduled for Tuesday, December 12, 2006 has been canceled. The next Vestry Meeting will be on Tuesday, January 16, 2007 at 6:30 PM. The Rector will be on vacation this week (December 4-10). >>> If you have any pastoral needs, please contact our Deacon, George Snyder. >>> For other needs or questions, please contact one of our Wardens, Gary Browning and Tony Rubino. >>> There will be no Wednesday noon Eucharist this week. >>> Next Sunday, December 10, we will celebrate Morning Prayer at 8:00 and 10:30. Coffee Hour hosts needed for the month of December. The Sign up sheet is on the bulletin board outside the church office. A planning meeting for a Habitat for Humanity Episcopal Build will take place on Thursday, December 7 at 7:00 pm at Christ Church, Dayton. If you are, or might be, interested in participating in this planning process, please contact either Mike Kreutzer or Don Nancarrow. Sign up sheets for the Christmas Pageant and Christmas Project are on the bulletin board outside the church office. performance on Sunday, December 3 at 7pm. Please call the church to receive tickets. God has given us everything: our lives, our talents and abilities, the world around us. All these things are gifts from God. God entrusts these things to us and makes us responsible for them. In other words, we are made “stewards” of things that belong to God. Deuteronomy states “Each of you must bring a gift in proportion to the way the Lord your God has blessed you.” Please include your “gift” among the pledges that will be presented as an offering during our worship services on November 19, 2006. It will take place on Wednesday, November 22 at 7:00 PM, here at St. Mark’s Episcopal Church. This Friday and Saturday, November 10 and 11, St. Mark’s Delegates – Gary Browning, George John, Kendall Rubino and Jim Rudd – along with our deacon, George Snyder, and our rector, Mike Kreutzer, will be participating in The 132nd Annual Convention of the Diocese of Southern Ohio. The central focus of this important gathering is the election of the Ninth Bishop of Southern Ohio. Please keep them, and all participants, in your prayers this week. Almighty God, giver of every good gift: Look graciously on your Church, and so guide the minds of those who shall choose a bishop for this Diocese that we may receive a faithful pastor, who will care for your people and equip us for our ministries; through Jesus Christ our Lord. Today’s Loose Plate offering will go towards “The Episcopal Visitation Fund.” This fund is used to assist seminarians with their education. Come Downtown for the 77th year of delicious waffles and other homemade lunch items. A small group of St. Mark’s members will be going after the noon Holy Eucharist Service on Wednesday, November 8th. All are welcome to come. For more information on this event please call 223-2239. On the main bulletin board, across from the church office, is a letter to the parish from the Rev. Michael P. G. G. Randolph, who served as St. Mark’s Interim Rector from 1995 – 1996. It includes a special remembrance of his son, Michael, Jr., who died this past summer. The Book of Common Prayer (page 312) lists five occasions as “especially appropriate” for celebrating the Sacrament of Baptism. Two of them are when the church is celebrating All Saints Day and whenever a Bishop is present. The year we have them both together! This Sunday, November 5, Bishop Benjamin Omosebi will be with us. He is a native of Nigeria, who is currently living in Cincinnati and assisting the Diocese of Southern Ohio. Those of you who have been with us for a while might remember that he was here at St. Mark’s once before, on May 4, 1997. If you, or someone you know, might be interested in being baptized, confirmed or officially received into the Episcopal Church, please contact the Rector as soon as possible. If you haven’t already done so, please sign up to donate coffee hour finger food for Bishop Omosebi’s visit on November 5th. The sign-up sheet is on the bulletin board across from the office. Thank you. Gary and Mildred Browning. · Remembering those who have joined our Heavenly Father this past year. Please contact the church secretary if you would like your loved one announced during the service. · Special Coffee Hour in celebration of Bishop Omosebi’s visit. Please plan on bringing finger foods to share. · Also this is Care House Sunday. Please pick up the Lion’s Tale for November today before leaving church. Please help St. Mark’s save money on postage! Thanks! St. Mark’s has had many volunteers over the years reach out into the community to help those in need. Here is a recent example where a couple of St. Mark’s parishioners refinished the gazebo at the Care House, located just across the street from Children’s Hospital. Girl Scout Troop 88 is collecting children’s and adult’s prescription eyeglasses and sunglasses as well as nonprescription sunglasses. Volunteers from Gift of Sight Foundation and Lions Club International clean, repair and classify the prescriptions and then hand deliver them to people in developing countries. Kaitlyn Apple will be collecting donated glasses the next two Sundays, October 22 and October 29. There will be a box located by the usher’s table for the donations. Tonight from 6:00 to 8:00 PM. Admission is one bag of candy. This event is supported by the Jr. and Sr. High Youth Groups. The youth group has a wonderfully spooky night planned for children of all ages. Come in your favorite custom and participate in the Halloween Parade or try to win a ghoulish delight in the cake walk. For more information on this event please contact T.J. and Jenna Walch. This Sunday, October 29th please remember to bring in your loose change for the Day of Change. The money collected during this special offering is given to help feed the hunger here in Dayton. All Saints Day is quickly approaching. During the 10:30 service on November 6th there will be a quiet memorial for those loved ones who have joined our Holy Father during this past year. If you would like to have a person(s) announced please print the person(s) name on the paper located on the offering table. at Community United Methodist Church. For more information please call 253-5169. The Directory for St. Mark’s is in progress to help us get your information correct please look at one of the 2 copies to verify that your are listed correctly. Also, if you would like to be added to the 2007 directory please PRINT your information on the back page. Thanks! There will be 2 parties to help celebrate Gordon Price’s birthday. On Saturday, Oct. 21 there will be a party here at St. Mark’s from 3:00 PM to -7:00 PM. On Sunday, Oct. 22nd, there will be a celebration after the 10:30 service at Christ Church. He would love to have you join him for either or both parties. If you could bring a snack to share, that would be helpful. And as Gordon Price would say…Your presence is present enough. Questions?? Call Mary Dahlberg or the Church Office. please pick up your Octobers issue of the Lion’s Tale. The Rector will be on vacation this week (i.e. Monday, October 9, through Sunday, October 15). >> There will be no noon worship service this week. >> Please contact our Deacon, George Snyder, with any pastoral needs. >> Please contact either of our Wardens, Gary Browning and Tony Rubino, with other needs or concerns. >> As usual, our Secretary, Rachel Huffman, will be in the office Monday, Wednesday and Friday from 8:30 until 2:30, and on Tuesday from 11:30 until 2:30. Be sure to be here for this wonderful opportunity! The Parishioner Action Team (PAT) is having a meeting after the church service on October 1st in the Lounge. Saturday, September 30th from 5:30-7:30 at Community United Methodist Church. Call 523-5169 for more information. What do United Way and your place of worship have in common? * We encourage persons with different skills & experiences to get involved. Together, we CAN do more than what we can do alone. Please support this year’s United Way campaign. Each of you recently received a letter describing three focused outreach opportunities for our parish: expansion of our existing tutoring program with Kemp Elementary School and creation of new programs with Canterbury Court and CARE House. Several activities were identified for these worthwhile ministries. Please show your commitment to these ministries and our parish by returning your completed pledge form to Jim Rudd as soon as possible. Together we can make a difference. St. Mark’s finished the regular season with 6 wins and 4 losses. We also ended up in 4th place in the Tournament. Congratulations to the team on another fine season! A softball banquet was held at “The Tavernette” in Medway on Saturday, September 16! Life Line Screening uses Ultrasound and Doppler to screen the Carotid Arteries in the neck for plaque buildup, and the arteries in the legs for Peripheral Arterial Disease (PAD). They offer a third screening that test for Aneurysms in the aortic vessel of the abdomen. Life Line Screening will also offer on that day a bone density screening. This is a preventative program, and is really worth participating in… problems can be detected early, and taken care of, before they become a big problem. Your results are sent to you and you are referred back to your own doctor. These non-invasive, completely painless screenings take about 10 minutes each and are offered for $45 each or $109 for all 3 vascular screenings. The bone density screening will be offered for $35 or all 4 tests will be offered for $129 total cost. YOU MUST PRE-REGISTER! Please call 1-800-324-1851 for your appointment or for more information. Many thanks to those who volunteered or participated in the 25th anniversary celebration! The first rehearsal of the year will be on Wednesday, September 6th at 7:30pm. We welcome all who wish to sing Gods praises. There are some corrections to the recent directory updates. Please contact the Church Office for details @ 256-1082. Today, September 10th at 10:30. This year’s location is Shelter #1 at Indian Riffle Park in Kettering. Come and enjoy a causal worship service with special music by the Christian band “Justus” followed by a wonderful picnic meal. Please bring a side dish or dessert to share, and lawn chairs. Directions to the park are located on the Ushers Table. For more information please contact Vic Howarah or any Vestry Member. CLICK ON THE PICNIC SIGN ABOVE FOR PHOTOS! Please pick up the September Issue of the ” Lion’s Tale” as you leave today. To everyone who helped with the Yard Sale. It was another big success this year! Each summer while the choir is on recess, we invite St. Mark’s parishioners to share their musical talents with us during our Sunday worship. We have had vocal soloists, duets and small choral groups; we have had a great variety of instrumentalists, from piano to guitar to clarinet to bassoon to violin to harmonica – and we have appreciated and loved them all. If you have some sort of musical talent that you might be willing to share with us, please select a Sunday and sign the sheet on the bulletin board outside the church office. If you have any questions, please contact Ruby Webster. Many thanks for sharing your gifts with us! at St. Mark’s on August 19th at 1:30. Thank you to all who participated in the Kemp School Cookout a huge success. Information on how you can be tutor will be available once school is in session. The school is willing to work with peoples schedules. Next week is the Church Yard Sale on August 12. Volunteers are needed the day of the yard sale. The sign up sheet in on the bulletin board outside the church office. Thank you! All Parishioners in their 20s and 30s (and their families) are invited to come to the Kreutzer’s house for a very informal get-together. The date is Friday, July 28, and the time is 6:00 PM – 8:00 PM. Food and drinks will be provided. St. Mark’s is currently blessed with a wonderful group of young adults. We want to make sure that they get to know one another and are able to build up the relationships among them. RSVP to Rachel in the church office, 256-1082. Starts July 10th – 21st. The Rector will be on vacation from Monday, July 3 (tomorrow), through Sunday, July 16. >>> Our church secretary, Rachel, will be in the office Mondays, Wednesdays and Fridays from 9 – 3. >>> On Sundays, July 9 & 16, our Deacon will lead Morning Prayer, beginning at 9:30 AM. >>> There will not be a noon worship service on Wednesdays, July 5 & 12. >>> In case of pastoral needs, please contact our Deacon, George Snyder. >>> In case of other needs, please contact either of our Wardens, Gary Browning or Tony Rubino. wording on our sign ??? In place of the generic term, “Worship,” our sign along Woodman Drive now reads “Holy Eucharist (Mass).” The Book of Common Prayer (p. 355) calls our Sunday worship service “The Holy Eucharist” and gives “the Mass” as another title (p. 859). The term “Mass” is used in many Episcopal Churches around the country, as well as in Roman Catholic churches and, increasingly, in Lutheran (ELCA) churches. It is a term which is readily identifiable by most people, clarifying the type of worship service to which we are inviting them. Please mark your calendar and join your fellow St. Mark’s parishioners following our worship service on July 16, 2006. Brief presentations will be given describing outreach opportunities for our parish for Canterbury Court (Program of Episcopal Retirement Homes) and Care House (Child Advocacy Center). Learn about these worthwhile potential outreach projects for our parish and how you can contribute your time, talent and treasure to help satisfy their needs. Lunch will be provided following the presentations. The office will be closed in observance of Independence Day on Tuesday, July 4th. This morning, July 2, there will be no Coffee Hour. Instead, immediately following the 9:30 worship service, we will have another church outing to Young’s Jersey Dairy, near Yellow Springs. Mark your calendars for a fun time of food and fellowship! Please sign up on the bulletin board outside the church office if you are interested in taking advantage of these money saving wristbands for Young’s. on Saturday, June 24, 2006 at 7:30pm. They will perform sacred works by Mozart, Handel, Bruckner, Rutter and Pinkham. The concert is free, and children are strongly encouraged to attend. Almighty and ever-living God, source of all wisdom and understanding, be present with those who take counsel in General Convention for the renewal and mission of your Church. Send down upon them, and upon the whole Church, the healthful Spirit of thy grace; be present with those who choose a Presiding Bishop for this Church that our Church may be a fruitful witness to Jesus Christ and that all may know the power of his forgiveness and the hope of his resurrection; who lives and reigns with you and the Holy Spirit, one God, now and for ever. Amen. This Sunday, June 18, Pat and Judith Doran will be hosting our Coffee Hour as part of their “farewell” to St. Mark’s. 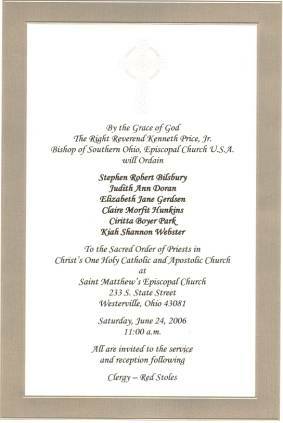 The following Saturday, June 24, Judith will be ordained to the priesthood during an 11:00 service at St. Matthew’s Church in Westerville. Beginning July 1, she will be serving as the Assistant Rector at St. Paul’s in Oakwood. Please remember to bring in non-perishable food items to be donated to the Food Pantry at St. Paul’s United Methodist Church at Fourth and Huffman in East Dayton. Received her High School Diploma from Beavercreek High School while attending part-time at Sinclair accomplishments. There will be rides, refreshments, games booths, and a flea market. Bracelets for unlimited rides between 1:00 and 6:00 pm on Saturday and Sunday afternoon may be purchased each day for $10.00. closed. Bishop Price has announced that the annual Pentecost offering, normally designated for new church buildings, will benefit a brand new congregation this year. Pentecost Sunday will mark the launching of St. Cyprian of Carthage in Columbus. Led by the Rev. Admire Cleeve, this congregation will be directed toward a growing population of West Africans in Columbus. St. Cyprian’s initial meetings will be at St. Paul Church on East Broad Street. Each congregation is encouraged to be generous with its Pentecost offering in support of this exciting new venture. The office will be closed Monday, May 29th in observance of Memorial Day. This will be a time to remember and honor those in all military forces who have died serving their country. An Honor Guard from VFW Post 657 will open the service, and will conclude it with the ceremonial laying of a wreath, the playing of taps, and a 21-gun salute. It sounds like a great theme for Lent and Easter, doesn’t it? We thought so, too! Beginning on Ash Wednesday (March 1) and on the following Sunday (March 5) and continuing for a total of six sessions before Easter and five more after Easter, Mike Kreutzer will be leading a study of these bringers of comfort and of “confident hope.” All sessions will take place in the Lounge. Wednesday sessions will be from 11:00 until 11:50; Sunday sessions, from 9:15 until 10:10. Please bring a Bible of your choice (Mike will be using the New Revised Standard Version, the one we use for the readings in church). If you’re involved in community ministry, please come to ECSF’s Dayton-area brainstorming session on Saturday, May 20 at Christ Church, Dayton. There are three goals for the workshop: 1. for the area’s Episcopalians to brief each other on what their churches are currently doing or thinking of starting; 2. to discover opportunities to collaborate; 3. to provide information for a profile of current community ministry for deaneries and the next bishop. The workshop runs from 10:00 am to 1:00 pm, and is free. ECSF is the diocese’s independent charity providing grants and free technical assistance for outreach. The facilitators will be ECSF trustees including ECSF President Leanne Puglielli, Monty Reece of St. Margaret’s, Trotwood, and Paul Rank, chair of the diocese’s National and World Mission Commission. Christ Church is at 20 W. First Street in downtown Dayton, and has its own parking lot. We’ll provide snacks, drinks, and dessert – all you need to bring is your knowledge and a brown bag lunch. Please RSVP to ECSF staff person Ariel Miller at 513-221-0547, or email her at ECSF@eos.net Please be sure to include your name, congregation, and phone number or email address. Hope you can join us! All are invited to bring a flower to church. During the service, all will be invited to bring the flower forward and, with the help of our acolytes, we will place the flowers into the holes on a large wooden cross. 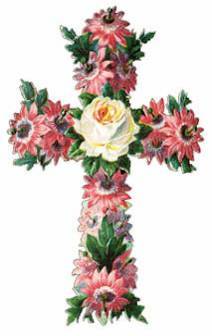 That cross will gradually burst forth in life, as a beautiful sign of our resurrection in Christ. We are trying to get a group from St. Marks to purchase season tickets at Wright State Theatre. It is an excellent theatre and nearby, plus easy parking etc… Season tickets are $77 for adults and $71 for seniors. The purpose of this is, so we could choose to go on the same evening and maybe have dinner together beforehand. It would be a nice St. Marks outing. Dave and Janet have more information if you require it. If interested please put your name on the sign up sheet across form the church office. The Story (Sept), Grease (Nov), Cat on a Hot Tin Roof (Jan), The Three-penny Opera (Feb), and Aida (May). The names on our Prayer List followed by an “*” have been on the list since sometime in 2005. If you would like them to remain on the list, please contact the church secretary this week. Thank you. She graduated with a Bachelors Degree in Dance yesterday from Ball State University, IN. He graduated with a Bachelors Degree in Primary Education yesterday from Toledo University. If you are graduating this spring from High School or College please let the church know so we can acknowledge your accomplishments. The Dayton Deanery of Episcopal Churches cordially invites Episcopalians from throughout the Miami Valley area to come and celebrate who and what we are at our Dayton Deanery Day celebration on Sat. April 29th. This event is being held to give Episcopalians from the area a unique opportunity to come together in worship and fellowship. The event will be held in our beautiful central cathedral of Christ Church in downtown Dayton. at the corner of First St. and Ludlow Ave. Our celebration will start out at 10:00 AM with Holy Eucharist and will feature a combined choir with participants from each of the deanery churches. Afterwards there will be time to meet and greet in the large parish hall that will feature displays of various projects and ministries that are active in our parishes. Workshops for various lay leaderships will be conducted later in the morning. All are welcome. Come celebrate who and what we are … Episcopalians. The tickets are in the Rector’s office. Where is the Bishop’s office? This Friday, it’s right here! Earlier this year, Bishop Price began having office hours in Columbus (where his office has been since coming to Southern Ohio), in Cincinnati (next to the Cathedral), and in Portsmouth (where the Diocesan Communications Office is now located). His intent was to make himself more available to anyone within the diocese who wanted to meet with him. Beginning this Friday, May 5, he is going to have office hours from time to time in Dayton as well, specifically, right here at St. Mark’s. He will be using the Rector’s office most of the time and the Lounge for larger gatherings. Would you like to make a donation for Easter Flowers? Envelopes are available throughout the pews or at the usher table at the back of the church. Please print for whom the flowers are given in thanksgiving, or in shoe memory they are given. The list of donations and whom they are for will be in the bulletin Easter Sunday. Thank you so much for helping to make our Easter celebrations beautiful. The Living Will and Healthcare Power of Attorney clinic will take place on April 2 at Community United Methodist Church starting at 11:30am. This is a FREE event. Essentially there will be attorneys on hand to answer any legal questions that anyone attending might have. After all their questions have been answered to their satisfaction, students will help attendees complete the appropriate forms. A notary will be on hand so that the attendees can leave with fully executed Living Wills and Healthcare Power of Attorney. The forms will be provided. Instructions for disbursement of these forms will also be provided. However, to be adequately prepared, attendee should bring their driver license or similar ID and the names of three persons whom they would like to make decision for them in the event they cannot make them for their selves. Additionally, they should bring the full addresses and phone numbers of the decision makers. If attendees would like to preview the forms we will be completing, they can be found on the Ohio Hospice website. On the rest of the Wednesday’s of Lent, we will once again be offering two opportunities to come together for prayer. Along with our noontime, quiet celebration of the Holy Eucharist, we will be celebrating recited Evening Prayer at 7:00 p.m. (on April 12, the Wednesday of Holy Week, Evening Prayer will be replaced by The Way of the Cross). Please plan to be with us for these brief (20-25 minutes) but meaningful times of prayer. Saturday April 8th 9am to ? and help clean the Church. Please bring your favorite cleaning gear/products and come ready to get dirty and I hope you can do windows! just outside the Church Office. Come enjoy a FREE Pancake and Sausage Breakfast provided by our very own local Girl Scout Troop 436. There will be crafts, pictures, games, and a puppet show for all ages! At Community United Methodist Church, located at 339 Meyer Avenue near Burkhardt Road. to help feed the hungry in Dayton. at the 10:30 celebration of the Holy Eucharist. See what Rev. McCoy has to say about SOLLI ! On March 21-26, 2006 Christ Church will be hosting a Genesis weekend retreat for Jr. High youth in the diocese. Registrations and payment are being taken through the diocesan youth office. In conjunction with the weekend there will also be a concert on Saturday night at 7:30 till 9pm by the Dustin Burke Bank, a contemporary Christian rock band. The concert is open to the public, especially to youth from area churches that are not attending the retreat. Cost of Admission to the Dustin Burke Band is one can of food per person. Additional information about the retreat can be found at the diocesan website www.dso.org on the youth page. The band also has a website at www.dustinburkeband.com for more information on the band. On Saturday, March 25th, Christ Church in Xenia will be hosting a concert at 7:30 till 9pm by the Dustin Burke Band, a contemporary Christian rock band. The concert is open to the public, especially to youth from area churches. Cost of Admission to the Dustin Burke Band is one can of food per person. The band also has a website at www.dustinburkeband.com for more information on the band. The Celtic Academy of Irish Dance presents a Fish Fry/Monte Carlo Night on Friday, March 24th from 6-11 pm. at the IUE Hall at 1675 Woodman Dr. in Dayton. Live Music will be provided by Dulahan with dancing by the Celtic Academy Adult Group. Tickets are $10.00 until March 23rd and $12 at the door. You must be 21 and over to attend. For further information please call the Celtic Academy of Irish Dance studio at 256-6086 or visit the studio location at 85 Woodman Dr. Tuesday through Thursday evenings. In 2003, the Archbishop of Canterbury appointed a commission to study how the Anglican Communion might move forward in light of the actions of the American and Canadian churches on issues of human sexuality. The result of that study is the Windsor Report, which was released in October, 2004. Our recent moratorium on the election of bishops in the Episcopal Church is one result of that report, and we have felt that moratorium most clearly in Southern Ohio where we were in the midst of our election process at the time the moratorium went into effect in March, 2005. Frank Wade is the recently retired rector of St. Alban’s Episcopal Church on the grounds of the National Cathedral in Washington, D.C. He is a well-known preacher and conference leader. He has served as deputy to many General Conventions and has keen insight into the workings of the Episcopal Church and into the relationship between the Episcopal Church and the rest of the Anglican Communion. Please join us for this interesting and informative afternoon. St. Mark’s has 4 free tickets available to this Sunday’s (March 5) performance by The Bach Society of Dayton, This special concert, titled “Celebrating Bach and Mozart”, will begin at 4:00 p.m. at the Kettering Seventh-day Adventist Church, 3939 Stonebridge Road in Kettering. Please contact Mike Kreutzer if you are interested. There will be pancakes, sausage, applesauce, and beverages and good fellowship for your dinner pleasure. Bishop Kenneth & Mrs. Mariann Price! The Plate offering for this Sunday, February 26 will go towards “The Bishop’s Discretionary Fund”. This fund is used to assist seminarians and for clergy emergencies. Thank you for all your support. Day of Caringis an ongoing effort to feed the hungry and the homeless in our community highlighted by an Annual Pancake Breakfast, our main fund-raising event of the year. We are proud to announce the 14th Annual Pancake Brunch will be held on Sunday, February, 26th 2006. Tickets: $6.00 for Adults or $4.00 for Seniors and Children 12 and younger. or visit the website www.day-of-caring.com for more locations. Do you have a special occasion you would like to celebrate with your Church family? Well here is your opportunity. You could sign up for the Coffee Hour, Altar Flowers or the Sanctuary Lamp. All sign up sheets are located on the bulletin board outside the church office. Hurry before your date is gone. Coffee Hour openings are: March 26th ; April 2nd ,9th ,30th ; May 7th ,14th ,28th ; June 11th ,18th ,25th; July 2nd, 9th, 16th, 23rd; August 13th; September 17th, 24th; October 1st, 8th, 15th, 22nd, 29th; November 12th, 19th; and December 17th, 24th, 31st. $6.00 Sanctuary Candle opening are: March 19th-31st; May 21st- 31st; July 2nd– 16th; August 6th-13th; September 3rd-10th; October 1st-15th; November 5th-12th; and all of December. $30.00 Altar Flowers openings are: April 30th; June 11th, 25th; July 9th, 30th; August 20th; September 3rd, 17th, 24th; October 15th; November 12th, 19th; and December 31st. Richard Benedum and Julane Rodgers will present a free concert of music for harpsichord and organ on Sunday, Feb. 26, at 4:00pm at St. George’s Church on Far Hills. The concert is free and open to the public. The performance will include music for harpsichord by Louis Couperin and Jacques DuPhly, and for organ by J.S. Bach and Louis Vierne. For more information please call 434-1781. Please note: no one will be “teaching a class”: this will be a book-discussion with everyone invited to read and participate. Through the generous support of the Faith-in-Life Commission, we have obtained 13 free copies of the book for those who choose to participate. On the main bulletin board, across from the office, is a sing-up sheet for the book. If 13 or fewer people want a copy, they will be free. If there are more than 13, we will buy additional copies and pro-rate the cost. Either way, it’s a great deal! No session on January 29, our Annual Parish Meeting. 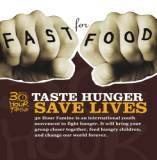 This February 24-25, teens nationwide are participating in the 15th annual 30 Hour Famine, forsaking food for 30 hours to get a taste of what the world’s poorest children and families face on a daily basis. Please support Chris Rogers as he is collecting donations for this worthy cause. Daytime Workshop: 10am -2pm. At the home of Anne Brewer located at 10345 Night Hawk Trail in New Carlisle. B.Y.O. brown bag lunch and scissors. Evening Workshop: 7:15pm at First United Methodist Church located at 235 Main St. in New Carlisle. Pin, cut, and sew children’s school clothing. For more information on these workshops please call Anne Brewer at 845-1697. On the bulletin board across from the choir room is a flyer explaining what Stitches United does to help those in need. On Friday, Feb. 17th at 6-9pm. If you have a favorite or unique chocolate creation bring it to share. A Sloppy Joe dinner will also be available. This is a free event and all are welcome to attend and participate. For more information please contact Rachel Huffman at the Church Office. This Sunday is Boy Scout Sunday! Some of the members of St. Mark’s Cub Scout Pack (Pack 5555) and their families will be joining us for the 10:30 worship service. We invite any scouts and former scouts in the parish to wear their uniforms, if they choose, and to join us in welcoming “our scouts” to St. Mark’s, next Sunday on February 5th! St. Margaret, Trotwood, will host a performance sponsored by The Dayton Opera, titled “Paul Laurence Dunbar: Common Ground” on Sunday, February 5 at 3 p.m. St. Margaret is located at 5301 Free Pike Trotwood, Ohio 45426. Admission is FREE–and everyone is invited. As Gary Browning, our Senior Warden, announced last Sunday, we will once again be joining in a church lunch after our Annual Parish Meeting. Please sign the list on the bulletin board across from the church office, indicating whether you will bring soup, salad, bread or a dessert. St. Christopher’s, Fairborn, is hosting a Women’s Symposium on Jan. 21 from 10 a.m. to 3 p.m. Lunch is provided. We need an RSVP simply to know how much food to prepare. RSVP’s can be called into the church at 937.878.5614. There is no charge. Entitled “Women Empowering Women,” the symposium features guest speakers, the Rev. Keely Watkins of Mt. Zion Baptist Church, (associate pastor) who works with ex-felony offenders; Darla Thompson, RN, and the Rev. Ruth Paulus, vicar of St. Christopher. Paulus will explore the “12 Moments in a Woman’s Life” as portrayed by Joan Chitister in The Book of Ruth. Thompson will speak about health and spirituality. There will be three workshops with time for questions, answers and peer interaction. It is a program geared to helping women mentor women, to talk about how we raise up future generations of women, and become who we are called to be as authentic women of God. This Sunday, January 15, most of the Rectors in the Dayton Deanery will be traveling to other churches for the day. This project is a way of helping us come to know our fellow Episcopalians better and enabling us to think of our place within the wider church, beyond our own parish. The Reverend Ruth Paulus will be at St. Mark’s to preside and give the homily at both Sunday worship services. Following her studies at Bexley Hall Seminary in Columbus, Ruth was ordained to the priesthood this past June. She serves as Priest-in-Charge at St. Christopher’s Episcopal Church in Fairborn. Please remember to pick up your new Parish Directory. Thank you. Stewardship is a year-round activity. God calls us to be good stewards of all His blessings: time, talent and treasure. St. Mark’s Stewardship committee will ask you to pledge a portion of your gifts of time and talent next spring. The current campaign requests that you pledge a portion of your gift of treasure. Once you have given prayerful thought to the amount of your treasure that is most appropriate for you; please turn in your pledge card by next Sunday, November 20, 2005. Your pledge will be included with those of your fellow parishioners as an offering during both worship services on that day. On behalf of the Stewardship Committee, I thank you in advance for supporting St. Mark’s mission statement through your pledge. God indeed loves a joyful giver. God has given us everything: our lives, our talents and abilities, the world around us. All these things are gifts from God. God entrusts these things to us and makes us responsible for them. In other words, we are made “stewards” of things that belong to God. Deuteronomy states “Each of you must bring a gift in proportion to the way the Lord your God has blessed you.” Please include your “gift” among the pledges that will be presented as an offering during our worship services on November 20, 2005. Your giving to God through St. Mark’s Parish enables us to share Christ’s message and make Christ’s love a reality for everyone within our reach. Your giving enables us to care for our immediate community as well as do our part for the rest of the world. As your support for St. Mark’s Parish grows, so does our ability to serve others in the name of the Lord. Please enclose your pledge in those presented as an offering during our worship services of November 20, 2005. God indeed loves a cheerful giver. Everything we have is a gift from God: time, talent and treasure. Christian stewards serve God out of love and gratitude for these gifts, knowing that it’s not how much we have but what we do with it that counts. Please pledge a portion of your gifts of time, talent and treasure to St. Mark’s parish in support of its mission statement to do God’s work. May your pledge be in proportion to the amount with which you have been blessed. Thank you. In place of a sermon this morning, everyone in the congregation will have the opportunity to choose Christmas hymns that we have not yet sung this year. Those that we sang on Christmas Eve, as well as those that we are already singing this morning, are identified by shading, helping us to avoid repetition. We hope that everyone enjoys, and is inspired by, our annual “Sermon in Song”! The Rector has been on vacation this past week (December 26 – January 1). >> Please contact our Deacon, George Snyder, for any pastoral needs. >> Please contact one of our Wardens, Gary Browning or Tony Rubino, for any other needs. >> There will no noon worship service on Wednesday, December 28. >> This Sunday, January 1, is the Feast of the Holy Name of Jesus. George Snyder will lead Morning Prayer at 8:00 and 10:30. The sermon for the 10:30 service will be our annual Celebration of Christmas Music: you pick the hymns to sing! The calendars are available in the church office for only $2.00 each. The Seaman’s Church Institute of New York and New Jersey is collecting calendars for seafarers. The calendars help to link seafarers to events at home and enable them to create a diary of their travels. The institute asks Episcopalians across the country to bring in all free or extra 2006 calendars local businesses have mailed out. A donation box is located in the church office. For more information about this project, please contact Ruby Webster. Come and make a difference in a child’s life by being a tutor at Kemp School for the 2005-2006 school year. This will be our 4th year helping local students in partnership with Community United Methodist Church and St. Mark’s Lutheran Church. If you are interested in giving a couple of hours a week there will be a volunteer orientation on Thursday, September 8th at 10:30. On the fourth Sunday of every month, the loose plate collection is designated for the rector’s discretionary fund. (Loose plate offerings are the cash and checks put in the offering plate that are not designated for any other purpose, e. g. pledge, altar flowers, etc.) The rector’s discretionary fund can only be used for the needs of the poor and is given out solely at the discretion of our rector. In the past, he has frequently used some of the money in conjunction with other local churches to help a local family in dire need. Additionally, the money is used to assist those who come to our church office in need as the rector deems appropriate. So if you would like to contribute to this important ministry, remember that your loose plate collection next week will be used to help the needy in our community. Our team finished the regular season with a 10-2 record, good enough to tie for first place and made it to fourth place in the tournament! Help Me Grow is asking for volunteers to help a local family who just came home with newborn triplets. If you could spare an hour or two to help to feed and care for these babies please contact Bernice Loiacono who is a Service Coordinator from Montgomery County Help Me Grow at 236-9965 ext. 2125. September 18, 2005 we resumed our regular Sunday schedule for Christian Education. We also resume our Children’s Chapel service. Beginning at 10:30, volunteer leaders provide a liturgy of The Word of God geared toward children from kindergarten through 3rd grade. The children rejoin their parents at the Peace. Also at 10:30, volunteers care for our youngest members (infants, toddlers and per-schoolers) in the Nursery. Parents are asked to come to take their children to the sanctuary with them at the Peace.